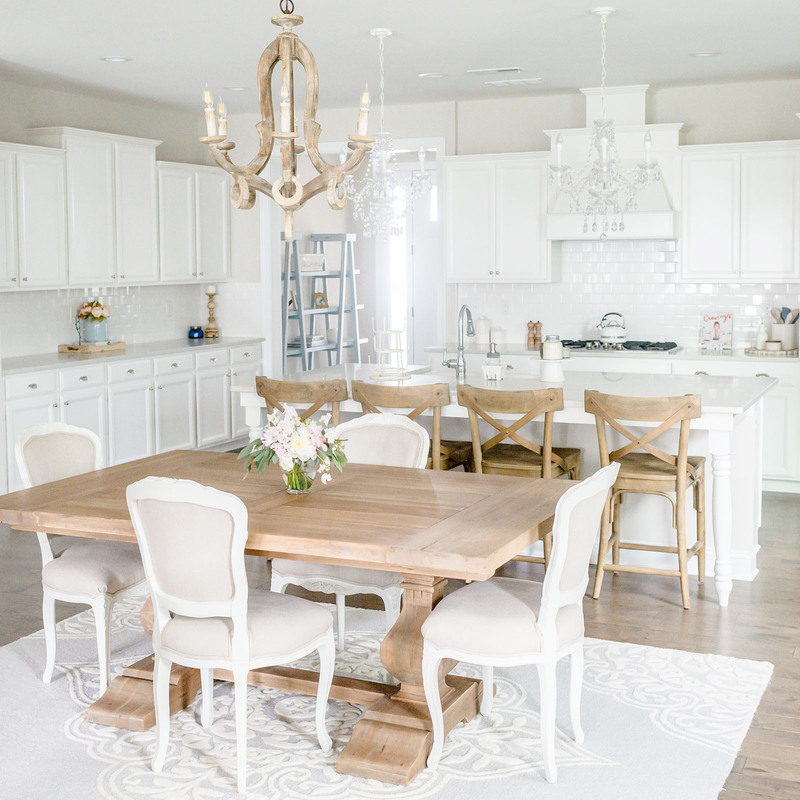 If you’ve been following along for awhile you know how much I love white decor! If you ask me, my taste is white, with a little white, and some light gray to bring it together. Even though a lot of people think I am crazy for having white in anything with 2 young babies, I don’t find it to be a big challenge! If you follow the right cleaning tips and use the right tools, decorating with white is a breeze! Since writing this post on How I Keep My House So…. White, I have been getting tons of questions and requests for more help! I’ve been making little notes of what I do that helps me manage the chaos and keep it all white and I am super excited to share them! 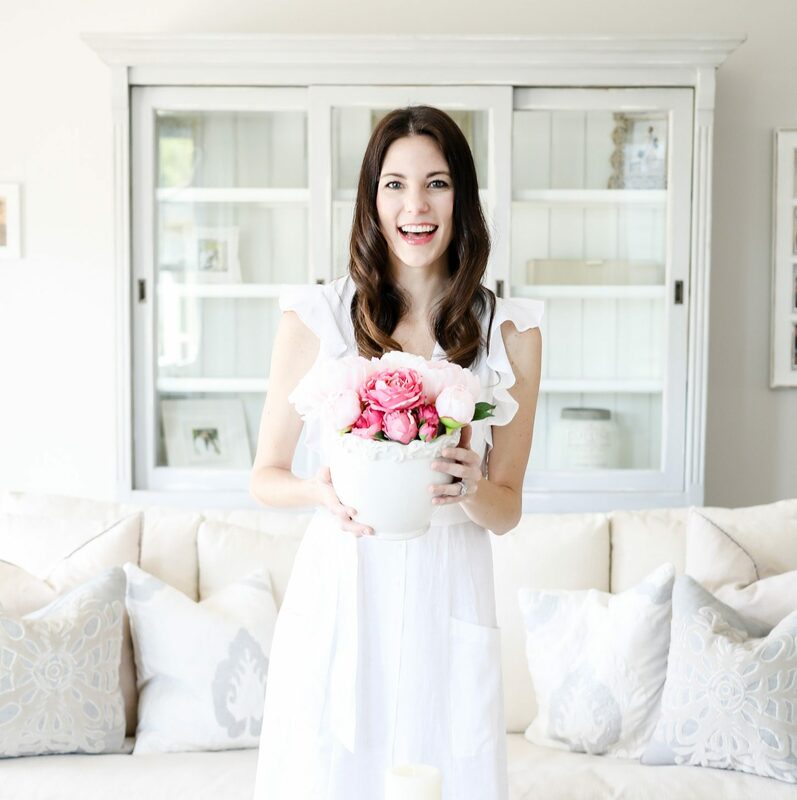 Here are my best cleaning tips and tools for a white home or for any kind of home! If you’re like me and limited on time (and energy) needed to keep your house clean, I am here to help! First, remember, messes are going to happen. My house definitely has its “train wreck” days and that is just part of making fun memories! So, relax, let the kids have fun and let cleaning be a stress reliever, not another stressor in your life. When it comes down to having kids and nice furniture, you need two VERY SIMPLE and VERY affordable things: Scotchgard and a fabric defuzzer. These two things are forever must haves in my home no matter what color I choose to decorate with. The fabric defuzzer can also be used on clothing BUT it is incredibly wonderful for making your furniture look brand new. It removes little knots, pulls on the fabric, and rubbed off denim pulls as well! It is a life saver! After that, wash or spot clean your couches and chairs and then use the Scotchgard. It’s so easy to use, spray on, let dry, and move on. You will thank yourself over and over for doing this. When there is a spill or stain, grab a water wipe and it comes right off! No more panicking about kids climbing, spills happening, or having guests over! The thing I do that helps me manage the house best is making sure I have easy access to cleaning products I like and that work. Being able to grab a cordless vacuum at anytime really increases the chances of me cleaning the floors daily. I took a few minutes to make sure I had my Dyson Cordless Vacuum hanging in a spot where I could easily grab it. You can also do this option which is a corded vacuum with a cordless hand option or these options which are more budget friendly than a Dyson: here and here. In addition to having a cordless vacuum readily available, I have water wipes for messes on the carpet, furniture, or for quick clean ups on baby hands and faces. They are so versatile and since they’re 99% water, they are safe for almost any couch, chair, or pillow! They have been a life saver for me and I get them in bulk on Amazon! You can read more details and tips in my first white decor post along with some additonal products I love! To keep things less overwhelming, here is a quick recap of what I do daily, weekly, and monthly that helps my home (at least the first floor) to look guest ready most of the time! Vacuum quickly with an easy to access, cordless vacuum or handheld like this one. Use a swifter type mop like this one for any spot cleaning or spills. Put toys in baskets or upstairs in the playroom. Put away any clutter on the table or kitchen area. Wipe down the counters. Mop all the floors with a good cleaner and bucket! The bucket makes all the difference in the world or you’re just pushing around dirty water (gross). Also, if you actually like your products, you’re more likely to use them. I like this mop, this one, and this bucket. I shared my cleaners below, too, and generally get them all off Amazon which tends to have a better product for less money. You can save time by mopping the baseboards which is much easier, too! In addition to doing the floors, I try to get the bathrooms cleaned, appliances wiped down, and kids rooms picked up every week or every 10 days. I love to spread cleaning out so I am not spending 5 hours every week cleaning, no one likes wasting a Saturday scrubbing the floors! When it comes to monthly chores, I try (I say try because I don’t alway get to it) to wipe down the windows, dust off any area that is obviously needing it, wash bedding, clean the shower/bath, wipe off the fronts of cabinets, and pick up the playroom so I can see the upstairs floor for about 20 minutes. Haha! I don’t usually get to this monthly but one of the BEST products to own is a carpet cleaner. They are affordable for any price range and make the world of difference for your carpets and rugs. You can also use the detachment that most come with to clean up furniture or other upholstery. By far my biggest must have! Your carpets will look brand new even using this once every 6 months. I’ve rounded up my favorites in the best sellers! So, how do you “do it all?” First, you don’t. Second, you buy one of these and let the kids help. It occupies them while showing them how to do chores. Win-win! Remember, give yourself a break and a glass of wine. Let the kids help and it becomes fun and entertains them for awhile, too! Emerson has had this set since he was just over a year old and 2.5 years later, he still loves it! Definitely the best investment! Love this post! I have a lot of white in my house as well one more actually cream but very close to white and I am always lookingfor tips on how to keep things clean with the kiddos. I was wondering how you use the Scotchgard I scotch guarding the couches but the fumes were so bad I had to take each pillow out in the garage and leave them overnight do you Scotchgard in your house or do you bring each piece outside to do it? They weren’t too bad for me!! I opened the doors to the porch and did it right there and let them air out for about 10 minutes! They dried super fast! Also, 2 light coats is better than 1 heavy so I went with that tip and it worked great! !